If you exclude temperatures after 1855 from your consideration, you can’t say much about the last 150 years, however hard you may try. 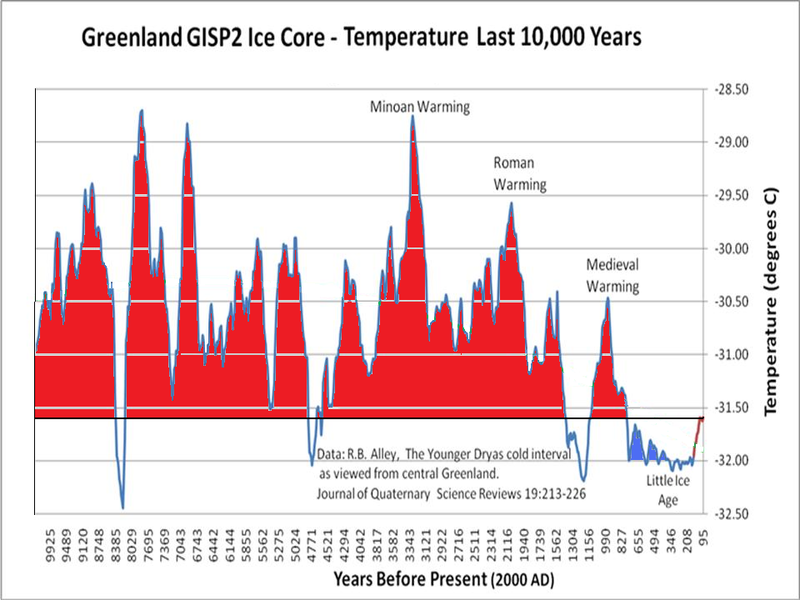 The real lesson from the Greenland temperature record is that if large changes in local climate can occur so quickly (over decades or less) without any extra forcing from greenhouse gases, then we should be greatly concerned. 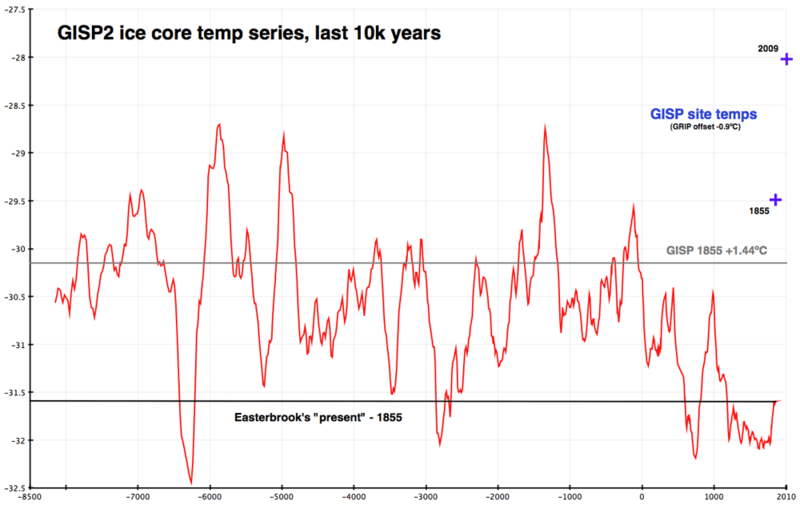 We’re giving the climate system a massive kick with our greenhouse gas emissions, and we should be very worried that, as Wally Broecker memorably put it, we’re prodding an angry beast with a sharp stick — the very opposite conclusion to the one Easterbrook draws. As Richard Alley put it in a post at Dot Earth last year: “using GISP2 data to argue against global warming is, well, stupid, or misguided, or misled, or something, but surely not scientifically sensible”. I was particularly struck by the ‘the only modern warming which might possibly have been caused by CO2 (1978-1998)’ which comes in at number 17 in his ‘hit parade’. Of course, we can’t see any of the 20th century warming on the accompanying graph, as it ends in 1855, and I have no idea why the special treatment is handed out to this particular 2 decade span. (I’m also a little suspicious that the value given in the bar graph for this particular ‘magnitude’ is actually just the sum of warming over the 2 decades rather than the associated rate per century that the scale at left identifies [and why Â°F ?]). Look, seriously, the rate of warming per century exhibited between 1978 and 1998 – ‘the only modern warming which might possibly have been caused by CO2’ – was, what, half or one third of a degree F (less? ), according to that bar chart? About a half or a third of the rate of 20th Century warming given? Forget about vinyards in York, It’s the vinyards in Sweden I find interesting. Wow, did Easterbrook not read any of the criticism of his earlier article, or is he just that dishonest and thinks he can get away with repeating untruths? But 1855 as “present”? I mean, it’s fine to be confused about what “present” means once, but he’s so clearly wrong, how can that not have penetrated somehow? Looks like a clear case of confirmation bias. Except if we read the actual scale on the bottom we can only actually see 95 years before ‘the present’; which he claims is 2000AD, hence 1905, but actually turns out to be 1855 – as, according to the provider of the original data, the present is a conventional date set at 1950! So, the last 155 years – during which time the best estimate, as provided by Gareth, suggests a temperature rise of 1.44 C, making an absolute nonsense of the ‘virtually all years… have been warmer’ claim – is not examined! If you follow the link, it’s instructive to check out just how few of the supposed ‘skeptics’ over at WUWT bother to read the graph closely enough – even taking it at face value and assuming a ‘present’ of 2000 AD – to say “hang on, that’s 1905, isn’t it? What happened since then? How does that relate to what you’re saying?” I counted (maybe) one in the first few dozen postings, then one indignant poster (suggesting WUWT’s ‘good name’ is being undermined) really lets rip before the actual substance begins to be dealt with. Or, to be more accurate, not dealt with. Some name-calling, a bit of argy-bargy, interspersed with the predictable paranoiac nonsense, crankeries, and uncomprehending motherhood statements. Throughout there’s a good deal of blarb about the EPA, the IPCC, and Obama, and (oh, the irony!) commentary on how the warmists will fiddle this one away, haven’t given the prof a decent break by excluding him from journals, etc. etc..
And yet despite all this, here, at the post we are currently discussing, is one variant on that same graph ending at 1855’s temperature (albeit shorn of the ‘present temperature’ label indicating that now-mysterious horizontal line, but with the series still terminating on that line at ‘0 thousand years before present’). And Greenland is the whole world, too! Whatever else it may be this isn’t science! It isn’t even close. ‘Peer-to-Peer Review’ is a crock. The Committee has today launched an inquiry into peer review. The committee invites evidence on the operation and effectiveness of the peer review process used to examine and validate scientific results and papers prior to publication. 8. possible alternatives to peer review. Nothing wrong with reviewing things now and again, eh John? It doesn’t mean there is anything wrong. Thanks for that link John. I’m not sure why the UK parliament thinks it needs to review peer review or what authority it imagines it has to make changes in the existing system. Reviews are done gratis as a professional courtesy to ones peers at the request of editors (well known and recognised scientists) of international scientific journals. I would hate to see any government interference. Even NOAA Paleontology had an error in their metadata. OK, great that you do your own digging — but I note with interest you don’t explicitly criticise DE, in fact you modify his claim by stating that there are 4,000 years warmer than now. I suggest you look at the blue crosses on my graph. In any event, if you had dug a little deeper you would have found that the GISP2 temps are not meteorological temps — they’re calculated from oxygen isotope data which is itself subject to complex interpretation, the dating depends on snow accumulation modelling. The relationship between the core temps and actual temps is interesting, and an active area of research — but at the present any claims about current versus paleo temps beyond the obvious broad brush interpretation is not justified. (In fact DE is on better ground looking at the rapid changes seen in the record, but they tell a rather different story as I point out in my conclusion). Actually, I confronted DE in an email exchange but he was intractable and I documented the exchange at CCG. Even though I generally subscribe to his future projections, I have always thought that his diagrams leave a lot to be desired,.his lack of knowledge of the British wine scene similarly. Kiwifruit are also being grown in Britain but whether either is a long-term proposition remains to be seen. If you had followed the WUWT links you would see that the figure is in excess of 5790 years warmer than present using your GRIP benchmark (adding 1.44 to the 1855 value). Exposure of the lax graphing is criticism enough in that instance because by the time I had figured it all out, the debate had finished and yes I did know that the GISP2 temperature reconstruction is not meteorological (the word “reconstruction” being self evident). I note that there is a new post at WUWT “New paleo reconstruction shows warmer periods in Alaska over the past 3000 years” re the paper “Six millennia of summer temperature variation based on midge analysis of lake sediments from Alaska”, Clegg et al in a similar vein to the DE post. Again, even taking things at the same face value, it’s a tremendous comfort to know that the complex, interdependent, industrially agricultural civilization of billions covering the world in 30BC and before endured conditions that may have been warmer – after all, this is only bloody Greenland we’re looking at here – than now! Wine was almost certainly made as far north as Lincoln (Lindum) in Roman Britain, but there is no sure evidence of vine plantings north of Middlesex. OTOH, Pete Gottgens planted vines on the banks of Loch Tay in Scotland – 100 km’s north of Glasgow – in 2005 and harvested a Riesling vintage in 2009. I don’t know it if will ever be sold as wine though – his company folded, and I’m not sure what the future is. Be that as it may, the crop was grown 400 kilometres north of Lincoln, and 600 kms north of any plantings certainly known from Roman times. Here’s another interesting discussion in the light of Delingpole’s ‘peer to peer review’ over at skeptical science. Plus Greenland is not the world, as has also been pointed out repeatedly. I also find it hard to credit that – despite any rather belated alarms as to the state of the Emperor’s attire – 90% of the readership at WUWT have not taken home the message that the nice prof has proved that it was warmer almost always than it is now, there is no current abrupt current climate change (and anyway things were worse 11 000+ years ago, and mass industrial civilization survived that, right?) and that the warmists will continue to unfairly exclude all this from public purview. Carol, I think even simple responses like yours will boost its ego. There will be no fun if they don’t get any acknowledgement other than red buttons. I feel his Greenland argument looks a bit flawed, and gets nobody anywhere anyway. Past changes of whatever magnitude dont disprove agw. There have likely been occasional rapid rates of warming in the very distant past regionally, eg coming out of the younger dryas period. The recent warming appears rather significant and fast over the period of the last few thousand years, and that the MWP appears rather weak. going back furthur its less certain but still appears to be rather rapid. AGW is highly consistent with a very large range of varied atmospheric and climatic observations. Nothing else even comes close. Interesting that your commenters hide a press release from the UK Commons. I have been looking at the grace data on changes to greenlands ice mass on scepticalscience.com, and there does seem to be a consistent accelerating decline. It appears to be a small proportion of total mass at this stage, but if this is the pattern from just 0.7 degrees of warming it is a bit ominous, or have I missed something? Nice Climate Crock on the global ice-core record + great Kirk Douglas moment – and Ernest Borgnine!